The Yankee Fork dredge near Bonanza City, Idaho, which operated into the 1950s. A gold dredge is a placer mining machine that extracts gold from sand, gravel, and dirt using water and mechanical methods. The original gold dredges were large, multi-story machines built in the first half of the 1900s. Small suction machines are currently marketed as "gold dredges" to individuals seeking gold: just offshore from the beach of Nome, Alaska, for instance. A large gold dredge uses a mechanical method to excavate material (sand, gravel, dirt, etc.) using steel "buckets" on a circular, continuous "bucketline" at the front end of the dredge. The material is then sorted/sifted using water. On large gold dredges, the buckets dump the material into a steel rotating cylinder (a specific type of trommel called "the screen") that is sloped downward toward a rubber belt (the stacker) that carries away oversize material (rocks) and dumps the rocks behind the dredge. The cylinder has many holes in it to allow undersized material (including gold) to fall into a sluice box. The material that is washed or sorted away is called tailings. The rocks deposited behind the dredge (by the stacker) are called "tailing piles." The holes in the screen were intended to screen out rocks (e.g., 3/4 inch holes in the screen sent anything larger than 3/4 inch to the stacker). The basic concept of retrieving gold via placer mining has not changed since antiquity. The concept is that the gold in sand or soil will settle to the bottom because gold is heavy/dense, and dirt, sand and rock will wash away, leaving the gold behind. The original methods to perform placer mining involved gold panning, sluice boxes, and rockers. Each method involves washing sand, gravel and dirt in water. Gold then settles to the bottom of the pan, or into the bottom of the riffles of the sluice box. The gold dredge is the same concept but on a much larger scale. 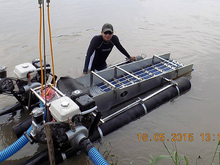 Professional gold miner using an advanced dredge system. Sumatra. Indonesia. May 2015. Gold dredges are an important tool of gold miners around the world.They allow profitable mining at relatively low operational costs. Even though the concept is simple in principle, dredges can be engineered in different ways allowing to catch different sizes of gold specimen. Hence the efficiency of gold dredges differs greatly depending on its specifications. By the mid to late 1850s the easily accessible placer gold in California was gone, but much gold remained. The challenge of retrieving the gold took a professional mining approach to make it pay: giant machines and giant companies. Massive floating dredges scooped up millions of tons of river gravels, as steam and electrical power became available in the early 1900s. The last giant gold dredge in California was the Natomas Number 6 dredge operating in Folsom, California that ceased operations on 12 Feb 1962 as cost of operation began exceeding the value of the gold recovered. 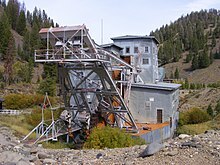 Many of these large dredges still exist today in state-sponsored heritage areas (Sumpter Valley Gold Dredge, this dredge was also an important part of the popular book series Skeleton Creek Written by Patrick Carmen in 2009, or tourist attractions (Dredge No. 4 National Historic Site of Canada). In the late 1990s and through today, dredging has returned as a popular form of gold mining. Advances in technology allow a small dredge to be carried by a single person to a remote location and profitably process gravel banks on streams that previously were inaccessible to the giant dredges of the 1930s. Environmental impact studies show no clear positive benefits from suction dredging and potential negative impacts on stream systems. Small scale suction dredging in rivers and streams remains a controversial land management topic and the subject of much political turmoil. ^ "Natomas Company History 1851-1984" (PDF). fairoakshistory.org. Retrieved 22 August 2015. ^ "Peru Takes Action Against Illegal Gold Miners, Upsetting Natives". Indian Country. 2011-03-03. Retrieved 2012-04-27. ^ "Guyana's exports to Canada enjoyed mixed blessings in last five years". Stabroek News. 2008-10-31. Retrieved 2012-04-27. ^ "Sierra Leone: Large Mineral Sands Mining Operation – New Dredge". Retrieved 2012-04-27. ^ "Gold Dredges, Bacon n' Beans, Crocodiles and Bananas". Alaska Gold Forum. Retrieved 2012-04-27. ^ Harvey, Bret C.; Lisle, Thomas E. (August 1998). "Effects of Suction Dredging on Streams: a Review and an Evaluation Strategy" (PDF). Fisheries. 23 (8): 8–17. Retrieved September 5, 2016. ^ Smith, David (April 24, 2015). "Suction dredging resumes amid conflicting interpretations of ruling". The Siskiyou Daily News. Retrieved September 5, 2016. Wikimedia Commons has media related to Gold dredges.